Sometimes a first impression does not serve the reader. The first ten chapters span a scant 32 pages and some two hundred years. More, those ten chapters bounce between different eras with different characters and it is initially difficult to get a handle on the focus of the novel. The initial impression given is that this early novel from Glen Cook, originally published in 1982, just is not as tightly controlled as readers might expect from Cook’s later work. That perhaps Cook is trying to do too much and go too big and this will be a noble failure. That’s the impression that readers who love the Black Company and the Garrett PI novels but couldn’t appreciate the Dread Empire novels might come away with. That impression would be so very wrong. Shadowline tells a multi-faceted story which, though initially confusing, ultimately coalesces into a very coherent tale of family and revenge (set a good thousand years in the future and in spaaaaaace). 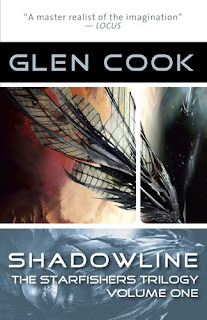 Initially offputting, the jumping around in time and character allows Glen Cook to present the origins of a conflict that should span generations, yet due to life-extending technology, still features the same major players. Cook dances around in time, and gives a number of clues to how things fit together, but the reader doesn’t know how until later. Who is the crazy old coot called Frog? Why is this minor chapter important? What about the framing chapters of Masato Storm? Much of the focus of the novel is on Gnaeus Storm and the framing chapters are twenty years later. And the bits with the Sangaree, an alien race which keeps humans like cattle? The opening chapters are so disconnected from each other, but patience is rewarded. Here Glen Cook’s craft and storytelling is in fine form. The characters and disparate story arcs are compelling even when the connections seem tenuous. Shadowline only improves with each passing page and though this is only the first entry of a trilogy, Shadowline feels complete and whole in its own right. This is an impressive novel, complete with generational politics, intrigue, and war spanning the stars. Oh, it’s good. With Night Shade Books re-releasing the Starfishers trilogy, this is the perfect chance to delve into a fantastic first volume of space opera. Reading copy provided courtesy of Night Shade Books.